We’d love your help. Let us know what’s wrong with this preview of Journal of Wong Ming-Chung by Laurence Yep. In 1852, during the height of the California Gold Rush, ten-year-old Wong Ming-Chung makes the dangerous trip to America to join his uncle on his hunt for a fortune. The true treasure for Ming-Chung, though, is America itself. In the midst of the lawless, often hostile environment, he is able to forge an international community of friends. Published April 1st 2000 by Scholastic Inc.
To ask other readers questions about Journal of Wong Ming-Chung, please sign up. This is an excellent entry in the Scholastic "Dear America" series. Aimed at the 9 to 12 year old age group, they are short novoels set in differening historyical periods in US history. At the age of 12 (page 34), Bright Intelligence has heard incredible news. He, who everyone calls "Runt", will be joining his Unclein the Golden Mountain (America). His older brother, Blessing, was the one his Uncle commanded to come---Uncles is legally the head of the family as the elder son--but Runt's parents d This is an excellent entry in the Scholastic "Dear America" series. Aimed at the 9 to 12 year old age group, they are short novoels set in differening historyical periods in US history. At the age of 12 (page 34), Bright Intelligence has heard incredible news. He, who everyone calls "Runt", will be joining his Unclein the Golden Mountain (America). His older brother, Blessing, was the one his Uncle commanded to come---Uncles is legally the head of the family as the elder son--but Runt's parents decide he must go instead. After a difficult two month journey in the hold of a ship, Runt finds his Uncle in a Chinese mining camp. At first his Uncle fears that Runt will be too smal to be of any use in a working camp. But as the boy confiders to his diary, he may not have his brother's size but he has more determination. The boy and his Uncle are soon working together on the hard task of mining gold. Besides weather and difficult physical labor, some American miners want the Chinese to leave--they blame them for all their bad luck. A very well written book. Young Ming-Chung is a scholarly but courageous lad and he works hard to be a good "guest" on the Golden Mountain. When he is later offered a job helping the mine owner with paperwork, he writes in his diary "I thought I would just cut down tress in America. However, maybe America needs strong minds as much as it needs strong backs. Perhaps there is a place for me here after all." (page 90) My absolute favorite quote from the book but it is well written throughout. Besides the fictional diary, an appendix at the end entitled "Life In America in 1852" and some pictures and maps help tie the fictional story to actual history. A great intoduction to an important era in California history for children ages 9 on up. If your kids like history, the entire "Dear America " series is of high quality,. I try to make it a point not to review Dear America/My Name is America books, because then I'd be here all day...I mean really, if I listed every book that I've ever read in my entire life...it borders on obsessive ridiculous. However, I'm making an exception for this one because it's actually a book that I'm proud to have read and one that I think was formative in my book reading endeavors. Obviously, the Dear America series is not classic literature, and it *can* get a bit...fluffy? Unsubstanti I try to make it a point not to review Dear America/My Name is America books, because then I'd be here all day...I mean really, if I listed every book that I've ever read in my entire life...it borders on obsessive ridiculous. The reason why this book stood out to me from other DA books isn't hard for me to pinpoint. I really, really liked hearing about Asian people in America, their beliefs, values, feelings...what they thought, why they thought it...for some reason, books like that are few and far between, especially for younger ages and/or casual reading. I mean (not to be racist), but there are lots of books on Caucasian Americans, African Americans, Native Americans...there just don't seem to be that many on Asian Americans. I really enjoyed this one. I liked that even though it was a short book, it was able to show so much about Chinese culture and family dynamics. The main character's evolving relationship with his Uncle, brother and parents throughout the book was one of the most interesting aspects. It also showcased how dire the situation was in China and why Chinese miners were willing to risk so much and put up with so much abuse. When I was wandering the aisles of the Scholastic Book warehouse, I saw this book on the discount table. I've been making a very concerted effort to add books to my classroom library that have ethnically diverse protagonists as I work in an incredibly diverse school with children from all over the world. I immediately grabbed this book and added it to my shopping cart. Now that I have read the book, I am glad that I made the choice to introduce this book to my students. In fact, I think it would When I was wandering the aisles of the Scholastic Book warehouse, I saw this book on the discount table. I've been making a very concerted effort to add books to my classroom library that have ethnically diverse protagonists as I work in an incredibly diverse school with children from all over the world. I immediately grabbed this book and added it to my shopping cart. Now that I have read the book, I am glad that I made the choice to introduce this book to my students. In fact, I think it would make a great companion piece to another book about the California Gold Rush called "By the Great Horn Spoon," which features a young white boy and his experiences during this momentous time in history. This "diary" is the story of a young Chinese boy who is sent to California to help his uncle in California. The goal, of course, is for the family to strike it rich by finding as much gold as they can on "Gold Mountain." Runt, as he is known, makes new friends from around the world and soon learns about the difficulties of life in California in 1852/1853. This includes thieves, harsh weather, racism towards immigrants especially Chinese immigrants, and so much more. Because of Runt's intelligence and smarts, he is soon playing a pivotal role in his new community, learning many new tricks and secrets. I liked this book because it provides a very different perspective on this time in history - that of the immigrant experience. It's nice to see books finally containing main characters who are not white. It allows kids to understand that the stories of others are just as important as the ones they are normally presented with. The book is easy to read and straightforward. I also appreciate that ithe book doesn't shy away from the more harsh aspects of life at this time. It acknowledges that people die, others survive to become successful, while still others fail and don't end up happy. It's honest, which I think kids like. I picked up this book because it was referenced by Jennifer Chambliss Bertman who wrote The Unbreakable Code (Book Scavenger #2). The tie in was a ship discovered under the bay of San Francisco which figured into the story. I was intrigued by the idea since I was aware of how many similar stories exist when cities seek to extend their usable land area into the waterfront. In this case there were so many ships that were parked and abandoned in the San Francisco Bay that the ships were not even m I picked up this book because it was referenced by Jennifer Chambliss Bertman who wrote The Unbreakable Code (Book Scavenger #2). The tie in was a ship discovered under the bay of San Francisco which figured into the story. I was intrigued by the idea since I was aware of how many similar stories exist when cities seek to extend their usable land area into the waterfront. In this case there were so many ships that were parked and abandoned in the San Francisco Bay that the ships were not even moved but just had dirt filled in around them. An interesting glimpse of the uglier side of the gold rush days. It was a lot of hard work and broken dreams, not the easy money that many believed. It's also a good lesson about the racism against foreigners, and the later focus on Asians. For kids, this should be a good introduction to this part of history. 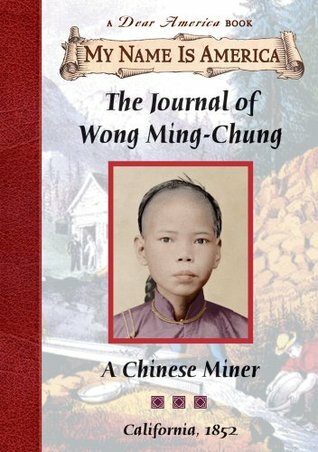 The Journal of Wong Ming-Chung: A Chinese Miner, California, 1852 Is a Great book about a Chinese miner who was sent to America to earn money for his family in China. He has struggles and regrets but ends up making good money in the end. I would recommend this book to people who like historical fiction and suspense. This books has me curious about the topic and interested to know how accurate this portrayal was. I think a lot of liberties were taken, but I still learned quite a bit about the different mining techniques used during the Gold rush as well as the culture of China back in the 1850s. I thought it was very similar to Dragon's Gate and then realized it was Laurence Yep! Not as nuanced as Dragon's Gate but informative and engaging for a younger audience. I’m disappointed that the main character was funny but mostly boring. Being shipped off to California, to find money for his family, at a young age is not that pleasing. He was not the one that was suppose to go to California, and look for gold as big as melons. His cousin, Blessing, was suppose to go but his parents sent Ming-Chung instead. Staying in a boat, to get to California was appalling. Meeting new friends, losing them and dealing with theft, Ming-Chung could not wait to get to California. When he gets to California, life was not how it seemed in his imag Being shipped off to California, to find money for his family, at a young age is not that pleasing. He was not the one that was suppose to go to California, and look for gold as big as melons. His cousin, Blessing, was suppose to go but his parents sent Ming-Chung instead. Staying in a boat, to get to California was appalling. Meeting new friends, losing them and dealing with theft, Ming-Chung could not wait to get to California. When he gets to California, life was not how it seemed in his imagination. There was never much time left for his studies, and his dream of being a scholar went away. However, when he got to California, he was admired by other Chinese miners because he could write Chinese letters to families back in the home country. Life is tiring and Ming-Chung has to live through every single day of it not letting his family down. However, one day he learned how cruel this world really was. He tries to deal with all the lies and abuse that Americans are treating his people at the mining camp; looting their goods and demanding sky-high taxes. Even though life is complicated, and he has to live his life with his Uncle, he still never gave up. He walked and searched for gold in over 20 abandoned camp sites, but he couldn't find anything. He is dealing with bullying and is trying to survive in a land where he doesn't know anyone. He never gives up at any point during the book. Ming-Chung is a strong kid, and will always stay strong. This story is about a young Chinese boy who lived in China around 1852. His Uncle goes to the U.S. to hunt for gold during the gold rush and Runt, as he refers to himself, ends up going to join his Uncle there. It’s really interesting how they describe the journey to the U.S. and how harsh it could be. There is also a very interesting description of what the port looked like where the ship, and numerous other ships, had docked and been abandoned. Then there’s the description of the journey to th This story is about a young Chinese boy who lived in China around 1852. His Uncle goes to the U.S. to hunt for gold during the gold rush and Runt, as he refers to himself, ends up going to join his Uncle there. It’s really interesting how they describe the journey to the U.S. and how harsh it could be. There is also a very interesting description of what the port looked like where the ship, and numerous other ships, had docked and been abandoned. Then there’s the description of the journey to the camp, the life in the camps, and especially the material showing just how hated the Chinese were and the dangers they were exposed to. This is the type of hatred that led to various laws aimed at the Chinese and even later the was related to the type of hatred towards Japanese-Americans in the late 1800's and early 1900's, leading to the internment camps of the Forties. I wanted to read this book because I felt that it would be a good chance for me to learn about my roots, culturally. I have not been true to myself in this manner because I have not gotten the chance to learn about what my people have done before coming to America. This book to me, provided the opportunity to read and learn. The book is about the journey of an young boy, Wong, who is forced to leave for America with his uncle in an attempt to fullfill the American dream. People associate the Am I wanted to read this book because I felt that it would be a good chance for me to learn about my roots, culturally. I have not been true to myself in this manner because I have not gotten the chance to learn about what my people have done before coming to America. This book to me, provided the opportunity to read and learn. Again, I am not disappointed with a book of the "Dear America" series. I was especially intrigued with the time period that this diary was set in; I love the late 19th Century in American history, the Gold Rush, the Transcontinental Railroad, California history, you name it. So reading any point of view from that time period - fiction or historical fiction - is great fun for me. I love the fact mixed with children's fun, as well as the epilogue and historical note in the back. I also love it when Again, I am not disappointed with a book of the "Dear America" series. I think you guys should read this book because this book is a lot of fun to read!This book was write by Wong Ming-Chung.This book is also about the gold rush that have happen!It mainly about people from china go to america to find gold.It a dangerous trip because in the golden mountain there a lot of thief that gonna steal the richest from them!This book is a Journal which tell people what have happen on Ming trip to the golden mountain!So why don't you read this book and find out what have hap I think you guys should read this book because this book is a lot of fun to read!This book was write by Wong Ming-Chung.This book is also about the gold rush that have happen!It mainly about people from china go to america to find gold.It a dangerous trip because in the golden mountain there a lot of thief that gonna steal the richest from them!This book is a Journal which tell people what have happen on Ming trip to the golden mountain!So why don't you read this book and find out what have happen after the book? It was a fantastic story of a young man filled with fears who leaves his homeland to find another. It wasn't perfect, but it didn't have to be. It made a smile to my face when I read the epilogue and finally closed the book. Perfect for those that want to learn more about the gold rush from a different view. Another Diary book. I loved the Chinese aspect, of course. Especially the English words for what I knew the Chinese for. I felt smart. :-) I also liked that it was a book about the part of the Gold Rush that I did not know as much of. And it was interesting to see the racism and treatment of foreigners within this book. Again, good for the 7-12 age group. Like the author, I grew up in California and always hearing the stories about the Gold Rush and visiting Gold Country often. This gave a good look into why people flocked to California and what really happened when they all came looking for the same thing, an item that was in limited supply. This was typical of what I had read concerning the California Gold Rush. All foreigners, but especially the Chinese were exploited and often driven off their claims. They had no recourse because there was no law, as California had recently been added to the U.S. What was interesting, was how resourceful the Chinese were in dealing with their adversaries. Again, I feel like this book was just okay. The story line was fine, the writing was fine, it just didn't hold my attention as much as I would have liked. I'm glad I read it as I learned a lot, but I probably won't read it again. 3 out of 5 stars. Really liked this book. It started with "Runt's" story beginning in China and carried over into the California Gold Rush mining fields. Lots of stuff going on all throughout the book, and really lovable characters. A great read. Originally published as part of My Name Is America series. This reprint has an eye-catching cover that helps convince reluctant readers that history is NOT boring. Lots of great Gold Rush facts, photos, and maps in the back of the book. i thought this book was intresting and so far its ok. once you start reading the first paragraph, you not going to want to stop reading it because every day he does something intresting.maybe the book cover does not look intresting but what he writes about is intresting. Although this is historical fiction, the story came to life for me. The way Wong Ming-Chung was treated holds true for traditional Chinese culture. I checked this out from the library, but I would buy it for my collection. Born June 14, 1948 in San Francisco, California, Yep was the son of Thomas Gim Yep and Franche Lee Yep. Franche Lee, her family's youngest child, was born in Ohio and raised in West Virginia where her family owned a Chinese laundry. Yep's father, Thomas, was born in China and came to America at the age of ten where he lived, not in Chinatown, but with an Irish friend in a white neighborhood. After Born June 14, 1948 in San Francisco, California, Yep was the son of Thomas Gim Yep and Franche Lee Yep. Franche Lee, her family's youngest child, was born in Ohio and raised in West Virginia where her family owned a Chinese laundry. Yep's father, Thomas, was born in China and came to America at the age of ten where he lived, not in Chinatown, but with an Irish friend in a white neighborhood. After troubling times during the Depression, he was able to open a grocery store in an African-American neighborhood. Growing up in San Francisco, Yep felt alienated. He was in his own words his neighborhood's "all-purpose Asian" and did not feel he had a culture of his own. Joanne Ryder, a children's book author, and Yep met and became friends during college while she was his editor. They later married and now live in San Francisco.